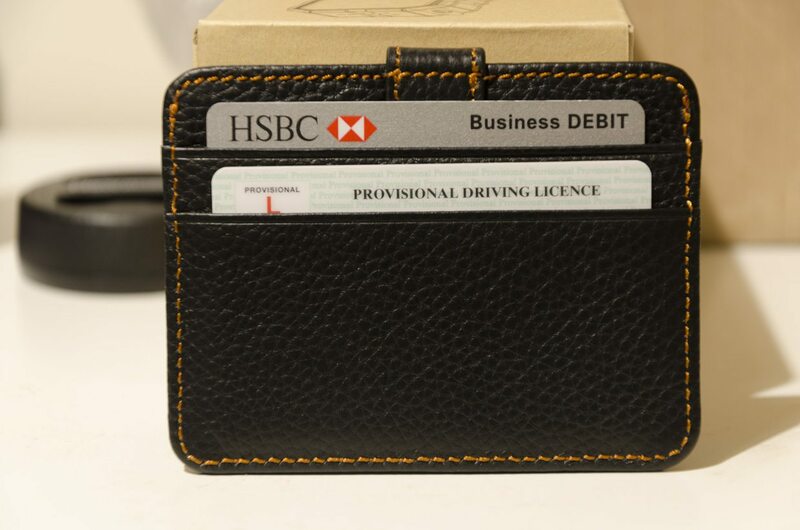 Today we’re looking at another RFID-blocking leather wallet from Lopoo UK. 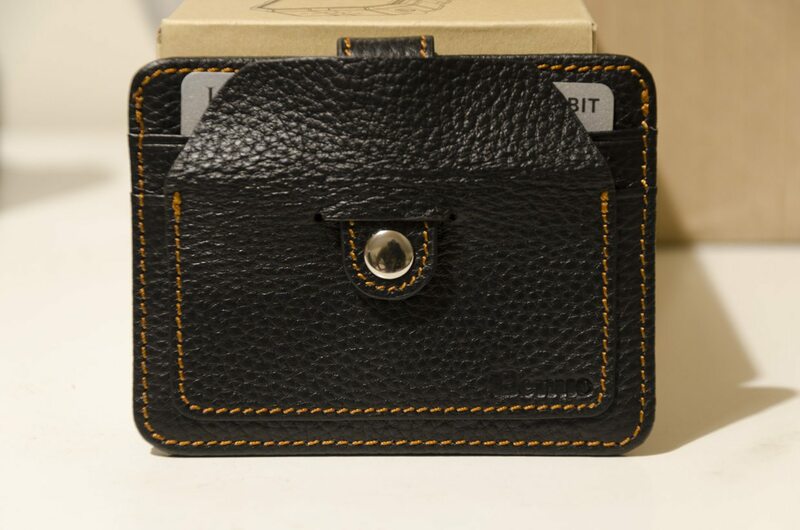 This is the Benuo Vintage Card Holder Wallet with a Coin Collection Pocket. The idea here is that we have a little pocket at the front with a hole in it, which makes it easy to put coins in without them rolling out again. We’ve tested it for one week, and here are our impressions! The wallet has a slim and attractive appearance, with a traditional black leather look, complemented by light brown (or orange) stitching. On the front, we have a traditional vertical strap with clasp that obscures the coin slot, the coin pocket itself, and two credit card slots. On the opposite side, there are two further card slots. It’s also possible to open the clasp to access a slim inner pocket from the top of the wallet. 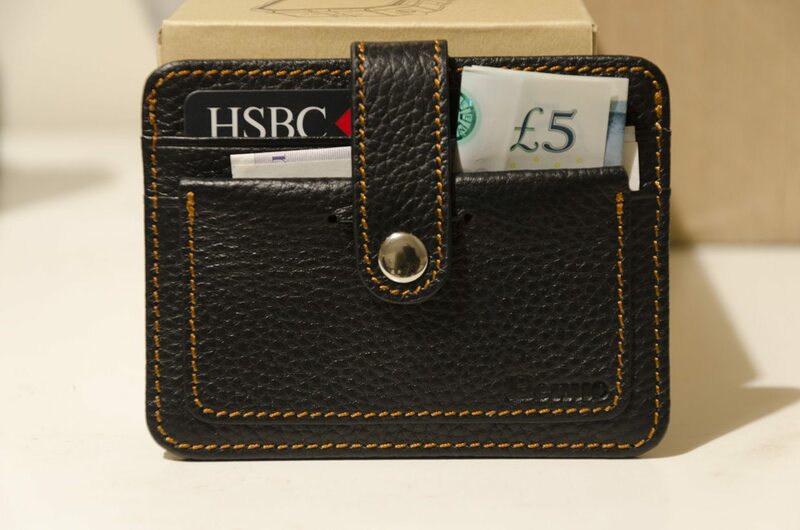 Here we’ve pulled the inside of the coin pocket out; this trapezoidal strip of leather prevents coins from falling out of the pocket even if the wallet is upended. You can see the size and thickness of the coin slot in the centre, which is sufficiently large to admit the vertical strap we discussed earlier. However, there’s no practical purpose to having the wallet look like it does below! Overall, it’s a fairly sensible design that takes up minimal space and still offers a decent amount of card storage. As mentioned earlier, we used this wallet for a week before putting finger to keyboard, so to speak. In general, we found that the wallet served its intended purpose admirably, safely storing a moderate amount of coins, cash and credit cards. However, the addition of a quantity of train tickets (ten, to be exact), made the wallet very tight — this wasn’t an issue with our previous Benuo wallet, and indicates that this wallet has a smaller capacity. That makes sense given that some space is devoted for the coin pocket. Actually inserting coins into the coin pocket was initially challenging, particularly for bigger or thicker coins like pounds or 50ps. You always need to undo the strap’s clasp to access the coin slot, and then do a bit of poking to actually open the slot. However, once enough coins are within the pouch, the coin slot will stay open a little wider, and the problem disappears. Retrieving them is also a bit of a faff, but it’s a more secure and tidy solution than throwing the coins in your pocket. If you often need a few coins in your wallet, this wallet is a nice choice. Otherwise, you’d be better served by a regular wallet without a coin section (if you rarely handle coins) or a dedicated coin purse (if you regularly handle a lot of coins). Otherwise, we had no issues using this Benuo wallet — it looked good, kept cash and cards alike secure, and generally did its duty.